It’s always fun to run a race away from home, in a location you are visiting for the first time. 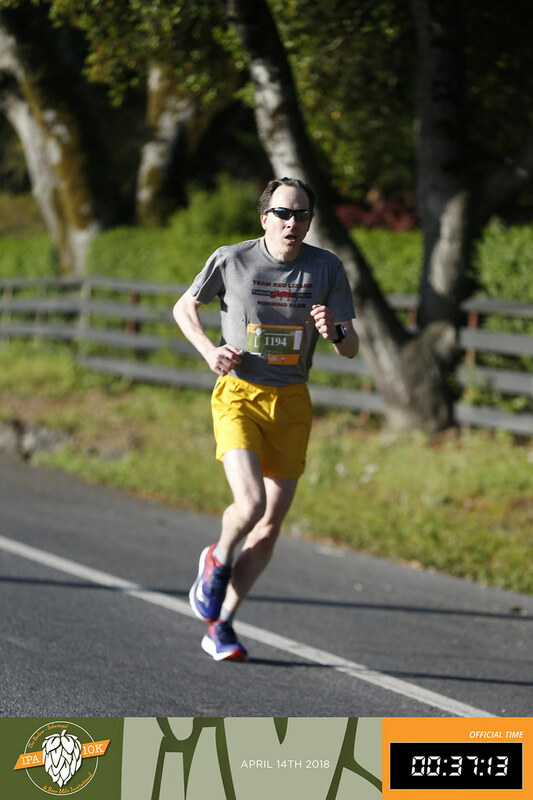 On Saturday, April 14th, a family trip coincided with the IPA 10K in Sebastopol, California, resulting in an exciting and challenging race on a great course, and a memorable experience overall. 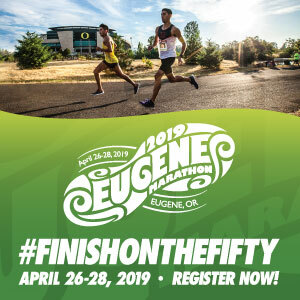 Organized by Motiv Running, the same company that was involved with this year’s Shamrock Run in Portland, the IPA 10K is part of a series of destination races consisting of several Wine Country Half Marathons, including the popular one in Oregon’s Yamhill County. 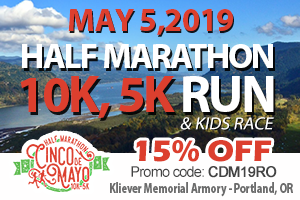 Having run the relay at the Oregon Wine Country Half Marathon a few years ago, I was looking forward to a similar event set in scenic surroundings. My wife and I stayed in nearby Santa Rosa the night before the race, within walking distance of the shuttle pick-up location announced in the pre-race information. Race morning dawned sunny and cool, with temperatures in the mid-40s. We found the hotel where the shuttles were scheduled to leave, along with a small group of runners milling around in a corner of the parking lot. After some confusion, we realized the small nondescript bus parked in another corner of the lot that we had noticed earlier was indeed our shuttle, and the small band of runners filed aboard. While the instructions proved mostly accurate, a small sign or sandwich board indicating we were in the right place would have been helpful. After a pleasant 15-20 minute ride, we arrived at the Barlow District in Sebastopol, a nice complex of local breweries and small shops where the race was set to start and finish. Sebastopol’s location reminded me of Corvallis, a medium-sized town several miles west of the freeway. After looping around a few blocks, the shuttle driver came to a dead end where the street was blocked off for the race. He offered to let us off there, and told us he hadn’t been told exactly where drop-off and post-race pick-up were supposed to be. A woman said she thought pick-up would be near the skateboard park, and pointed in that direction, so we had a better idea of where to go after the race. “The Barlow” was a perfect venue for staging a race, with a nice grid of wide streets and welcoming buildings, and the area had been blocked off from cars to allow race participants to wander traffic free. Signposts were set up pointing the way to packet pickup, bag check, the start line, and other important locations. Packet pickup was easy and efficient, with tablets set up to look up your race number before getting in the lines to receive your bib, T-shirt, and extra-large safety pins (not big enough to weigh you down, though, and definitely better than the little flimsy ones at some races that come undone too easily). The shirts were very soft and comfortable, but I was slightly disappointed that this year’s shirt didn’t include the location of the race, as part of the fun of running a race is showing off your travels back home at your group runs. However, that was soon forgiven as we found an assortment of other shirts for sale, including one with “Sebastopol, CA” boldly imprinted along with a colorful race logo. The weather was perfect for racing, still cool in the shade but with an increasing hint of warmth in the bright sun. After a brief easy warm up around The Barlow, we headed back to bag check to drop off our warm clothes and reveal our matching Team Red Lizard race shirts. The line was short when we got there but quickly grew as start time approached. After a few more easy strides, it was time to head over to the start for final announcements and the traditional pre-race beer toast. Then we counted down from 10, the horn sounded and we were off, into the sun, and for me into the unknown, since I had never run this course before. A quick left turn led us onto a long wide flat straightaway, and I settled into a brisk pace. Coming into the race, I didn’t have a set plan, having been concentrating on logistics and just trying to get to the start on time. Should I run it at a “comfortable” pace and just enjoy the scenery of a new town? 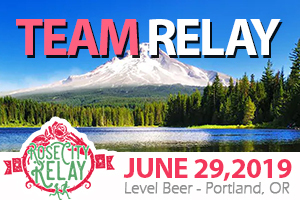 Or should I run it aggressively and try to represent Portland and my running club by finishing as competitively as possible? Within a few strides I realized my competitive instincts were taking over, and the race would be a hard effort. After the cold and often wet fall, winter, and early spring in Portland, it felt great to be running in the mild, dry California sun. I immediately loved the course as it wound along quiet city streets in the early stages. There were a few gentle hills early on, and I assessed the runners around me and calibrated my pace. After a couple miles, I could tell I was pushing my limits and it was going to be a long, hard 6.2 miles if I chose to maintain my current speed. Joe settles into his pace early on along a rural part of the course. Soon we left the city and headed into a more rural area. At various points the route reminded me of familiar Oregon race courses. A stretch alongside a field was reminiscent of the Wheatfield Half Marathon, and as I approached one intersection I could have sworn I had suddenly been transported back to the Cascade Half Marathon course and an identical junction, except that the weather was much, much better! Deja vu struck again when I began to climb a steep and deceptively long hill around the 3-mile mark, very similar to the infamous Glenmorrie hill on the Up The Lazy River 10K course. Although the course continued with a slight uphill along this stretch, I began to feel a little stronger, and soon I crested the hill at last and the path left the road and started downhill through some woods. The next couple miles continued downhill along the wooded multi-use path, and I started to regain momentum in earnest. This section was my favorite part of the course, despite some long straight views ahead that seemed to exaggerate the distance. When you can see the leaders in the distance up ahead of you, it can mean one of two things: Either you’re closing in on them, or it’s just a long straight section. In this case, it was the latter. I must have been throwing a scare into the guy in 3rd place though, as he kept looking back at regular intervals during the last couple miles. Trying to finish strong along the final straightaway. I walked back out onto the street to watch my wife finish. The long straightaway was mentally tough for runners but great for spectators, as you could spot your favorite runner from a long way off. Soon I picked out my wife’s bright orange compression socks speeding toward me and I cheered her loudly as she turned the final corner and sprinted toward the finish, setting a new 10k PR! We picked up our clothes from bag check and wandered over to the vendors area to pick up our free silicone mini beer glass with the race logo. Neither of us are big beer drinkers (I know, ironic at a beer-themed race! ), but the crowd seemed to be enjoying the opportunity to sample a variety of local craft brews. There were a couple food vendors at the far end of the area, but they weren’t offering free samples, and it would have been nice to have had more food offerings in addition to the beer. Around 10:00 it was time for the awards, with the top three men and women and the top masters receiving beer or cider from the sponsors and the overall winners also scoring gift certificates and swag from Fleet Feet and New Balance. 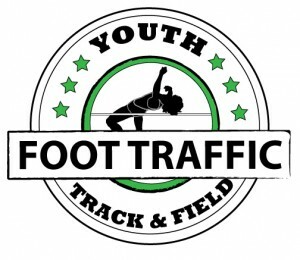 The top three finishers in 10-year age groups also received prizes. It would have been nice to include some kind of lasting award with the race name for posterity, but the prizes that were presented were very generous. We had considered staying to watch the Beer Mile, but with the 10k starting at 8:00 and the Beer Mile not starting until noon, we realized the gap would be a little too long for comfort. The lack of food options was a factor too. Petaluma band The Highway Poets provided entertainment for those who stayed, however. We headed in the general direction that the woman on the morning shuttle had indicated, and, sure enough, located the skate park, reassured when we saw two shuttle buses parked at the curb. Our timing was good, because a group of young, fast looking athletes were disembarking, at least one of whom was carrying a four pack of bottled beer. A dead giveaway that the elite beer milers had arrived. We boarded one of the buses and were soon on our way. There was only one other passenger though, and we wondered how many others may not have known where to find the departing shuttles. A couple blocks later we spotted a “Shuttle Bus” sign on the sidewalk near the finish area, but nobody was waiting, so after a minute or so the driver continued on her way back to Santa Rosa. The ambiguous shuttle stop locations were a significant glitch that will hopefully be ironed out in subsequent years. But niggles like food and shuttles aside, this was a very fun and well-organized event. The volunteers were universally cheerful and friendly, and the course was outstanding. The route was a “lasso”, with a mile-long out-and-back at the start and finish, and a large loop in the middle miles. The familiarity of the course near the end was welcome because it helped you gauge how close you were to the finish, and the loop kept boredom at bay, and provided a great tour of the city and the surrounding bucolic countryside. The course also contained a nice variety of flat sections and hills, as well as road and bike path, sunny open fields and shaded woods. It also helped that most of the uphill was in the first half, with an extended downhill in the final miles. The course signage was good and clear, if a little small. Each turn and crossing was clearly marked with a sign containing a distinct arrow, and even if you didn’t spot a sign, there were helpful and encouraging volunteers at every intersection and significant point along the course. Water stations were spaced well throughout the race as well. The IPA 10K was an excellent “vacation race” in a new-to-us area, a highlight of our racing careers. And on a personal note, the fact that I persisted when I felt like giving up, and finished with a surprisingly good result, along with my wife’s PR, means the race will be etched in my memory for a long time to come. 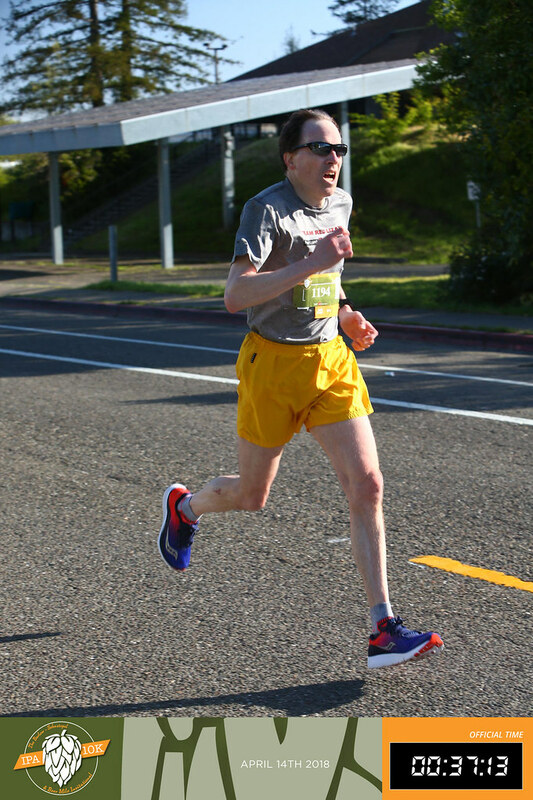 If you plan to be in the North Bay area next year around this time, I highly recommend giving the IPA 10K a try! Full results of this year’s IPA 10K can be found HERE.